Canada’s federal government is getting ready to declare triclosan as toxic to the environment. The government’s draft risk assessment, set to be published on Friday, notes that triclosan is toxic to the environment, but also states that there’s not enough evidence to say it’s hazardous to human health. Still, this is good news. Once a chemical receives a toxic designation under the Canadian Environmental Protection Act, a process is triggered that attempts to halt the use of the chemical and may result in a ban of the chemical in a range of personal-care products. This decision comes after much work from various Canadian organizations. In 2010 The Canadian Medical Association (CMA) wrote a letter (pdf) to the Health Minister outlining their concerns regarding household antibacterial products, including triclosan, due to the risk of increased bacterial resistance. CMA also asked the Health Minister to emphasize that soap and alcohol-based solutions are as effective in preventing household infection. At the same time, Environment Canada has been studying the impact of triclosan on the environment and the Canadian government has been reviewing the safety of triclosan under the government’s Chemicals Management Plan (CMP). Image by garytamin via sxc. Triclosan (pdf) is a synthetic, broad-spectrum antimicrobial agent (bacteria killer) found in products such as deodorants, toothpastes, mouthwashes, cosmetics, fabrics, plastics and of course antibacterial soaps. However, there is currently no evidence that says you gain extra health benefits when you use products containing triclosan instead of plain old soap and water. On top of that, triclosan may in fact cause health problems. Beyond Pesticides notes, “Studies have increasingly linked triclosan to a range of health and environmental effects, from skin irritation, allergy susceptibility, bacterial and compounded antibiotic resistant, and dioxin contamination to destruction of fragile aquatic ecosystems.” The World Health Organization (WHO) and The Centers for Disease Control and Prevention (CDC) agree that there are no added benefits for kids or adults who use household antibacterial products. Lastly, if you’re on the fence, be aware that the Environmental Protection Agency (EPA) says antimicrobials are pesticides – and who wants to lather up or brush their teeth with pesticides? Due to the above, Canada’s proposed toxic designation announcement is good news for Canada, but the United States is still wrestling (slowly) over what to do about triclosan. The current FDA standpoint on triclosan is that, “Triclosan is not currently known to be hazardous to humans.” However, the FDA also states that since they last reviewed triclosan, “Several scientific studies have come out that merit further review.” They also note that animal studies show that triclosan alters hormone regulation and that this chemical may contribute to the growing problem of antibiotic resistant bacteria. The rumor mill notes that the FDA is set to release their own triclosan risk assessment next year, but one, don’t hold your breath, and two, for now, triclosan will still be showing up heavily in U.S. soaps, toothpastes and other body care goods, unless you decide not to purchase it. It’s hard to avoid triclosan, as it’s in 76% of liquid soaps and 29% of bar soaps along with toothpaste, cosmetics, face wash, deodorant, counter-tops, textiles, kitchenware and even children’s toys. But you can make a good faith effort to avoid triclosan. First, avoid all antibacterial soaps. Washing your hands or body with plain, non-antibacterial soap is considered a healthy choice by almost every major health organization. For all other products, such as kid-safe toothpaste, read your labels, avoiding products carrying terms like “triclosan,” “triclocarban,” and “antibacterial.” You can also check out Beyond Pesticides’ list of triclosan-free companies list or visit Food & Water Watch to see companies who do and don’t use triclosan in their products – for example, Lush, Dr. Bronner’s, Weleda and Toms of Maine don’t use triclosan. Canada's federal government is getting ready to declare triclosan as toxic to the environment. 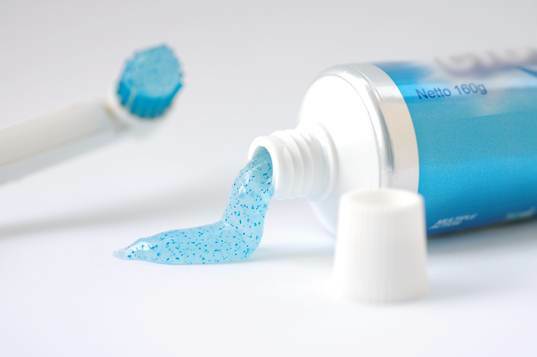 The government's draft risk assessment, set to be published on Friday, notes that triclosan is toxic to the environment, but also states that there's not enough evidence to say it's hazardous to human health. Still, this is good news. Once a chemical receives a toxic designation under the Canadian Environmental Protection Act, a process is triggered that attempts to halt the use of the chemical and may result in a ban of the chemical in a range of personal-care products. This decision comes after much work from various Canadian organizations. In 2010 The Canadian Medical Association (CMA)�wrote a letter�(pdf) to the Health Minister outlining their concerns regarding�household antibacterial products, including triclosan, due to the risk of increased bacterial resistance. CMA also asked the Health Minister to emphasize that soap and alcohol-based solutions are as effective in preventing household infection. At the same time, Environment Canada has been studying the impact of triclosan on the environment and the Canadian government has been reviewing the safety of triclosan under the government's�Chemicals Management Plan�(CMP).